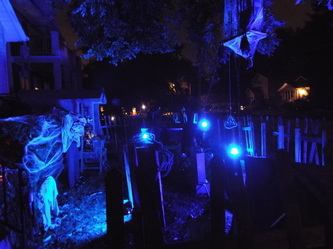 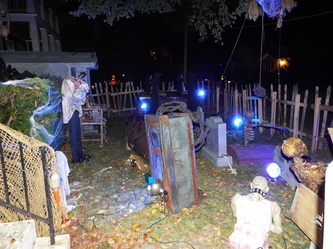 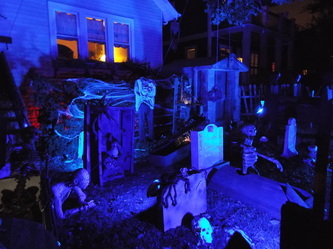 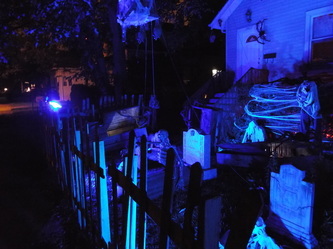 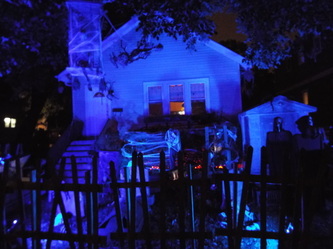 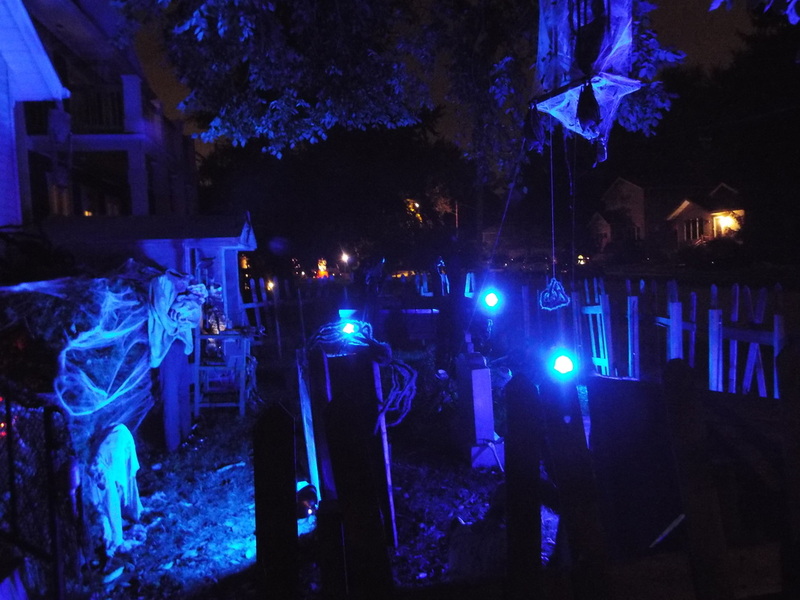 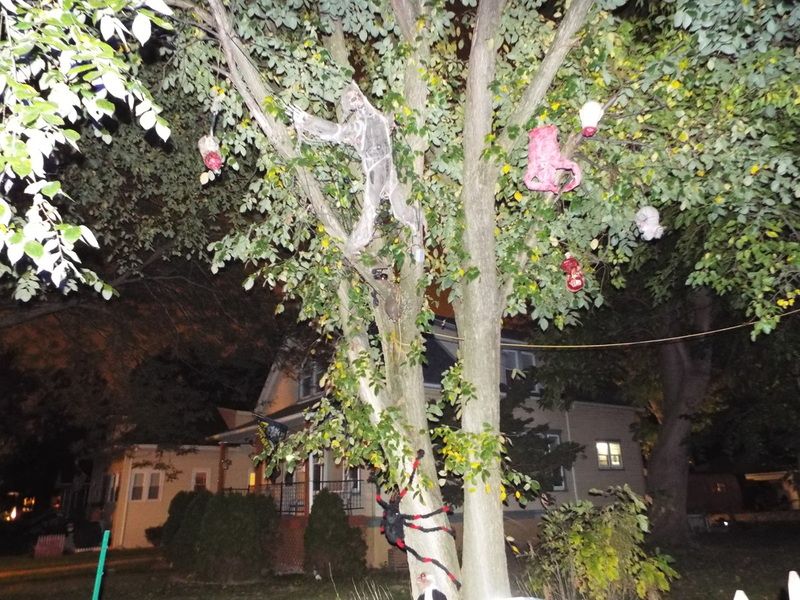 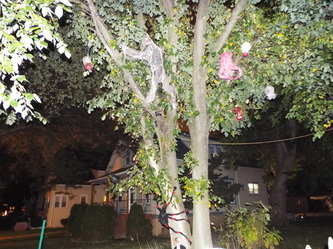 Monsters on Morris is an excellent yard display located in the Chicago Southland area. 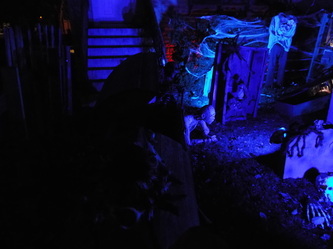 It has been running since 2011, and it has grown a bit each year, with new things beings added each time. This year's new addition is a group of skeletal pallbearers carrying a coffin outside of a crypt, which was a new addition for last year. 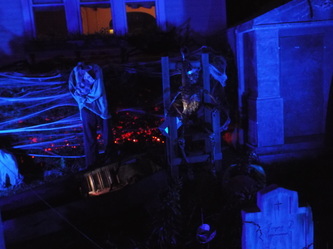 The theme for Monsters on Morris is one of a graveyard populated with various skeletons and zombies. 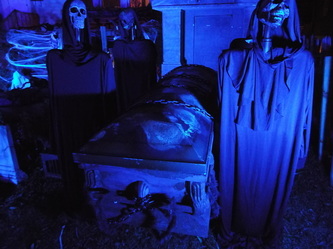 In addition to the standard tombstones and such, the real attractions here are the various real coffins, both metal and wooden, that adorn the setup. 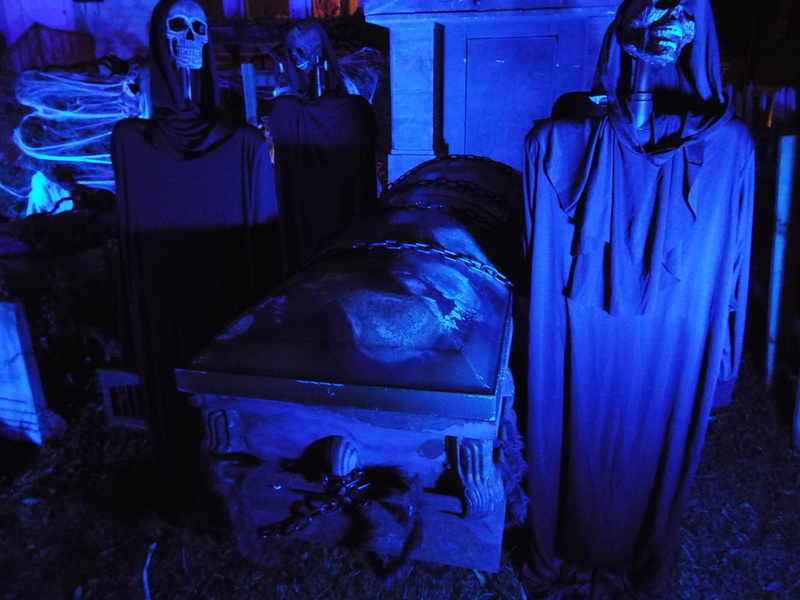 There are half buried coffins, wooden coffins with skeletons punching through them, and even a full sized metal casket that looks as though it has been underground.. All of them are effectively displayed, and the fact that they are real simply adds to the creepy atmosphere. 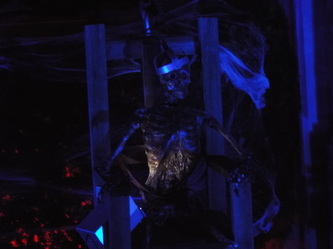 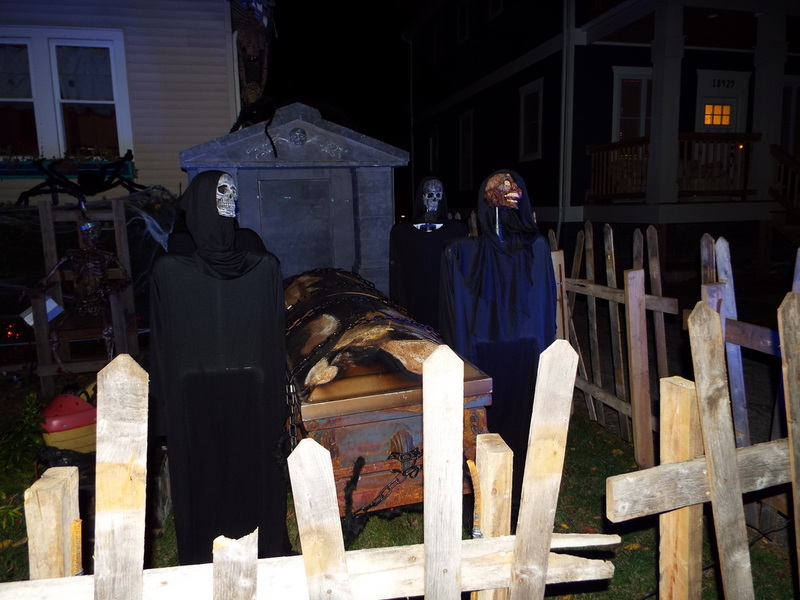 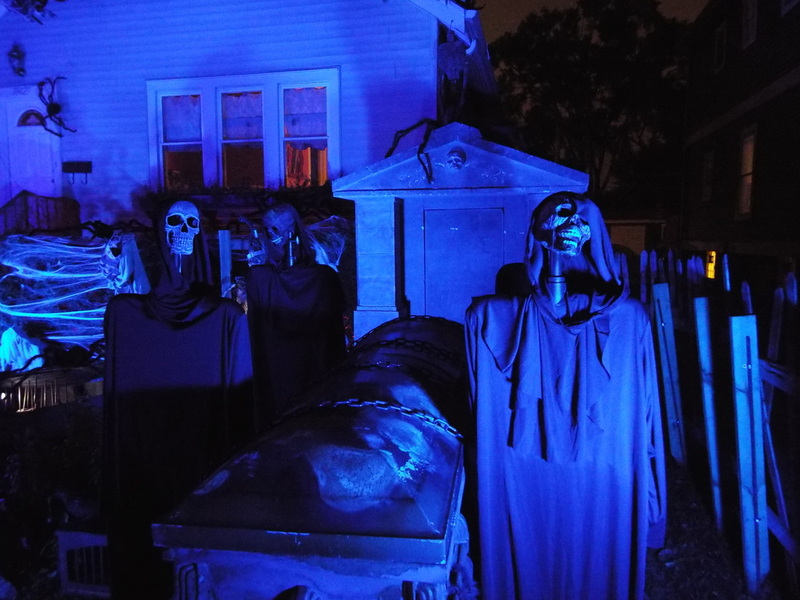 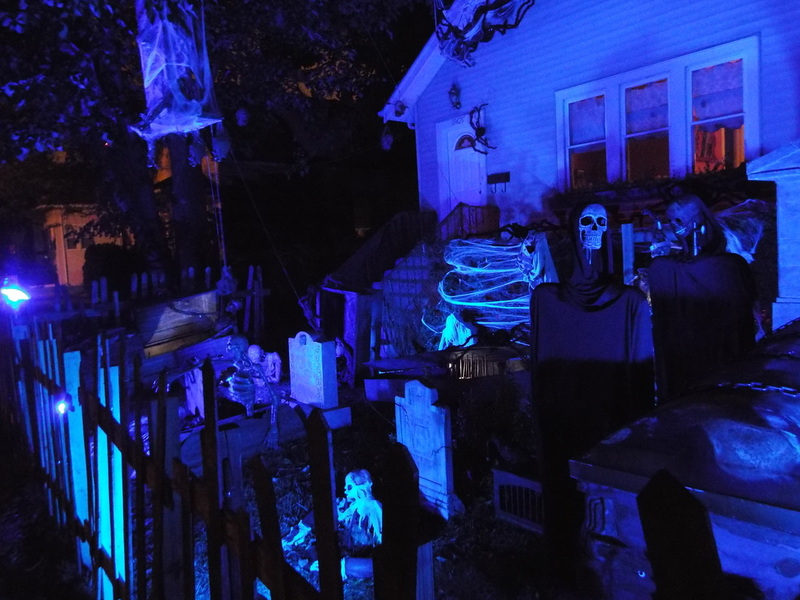 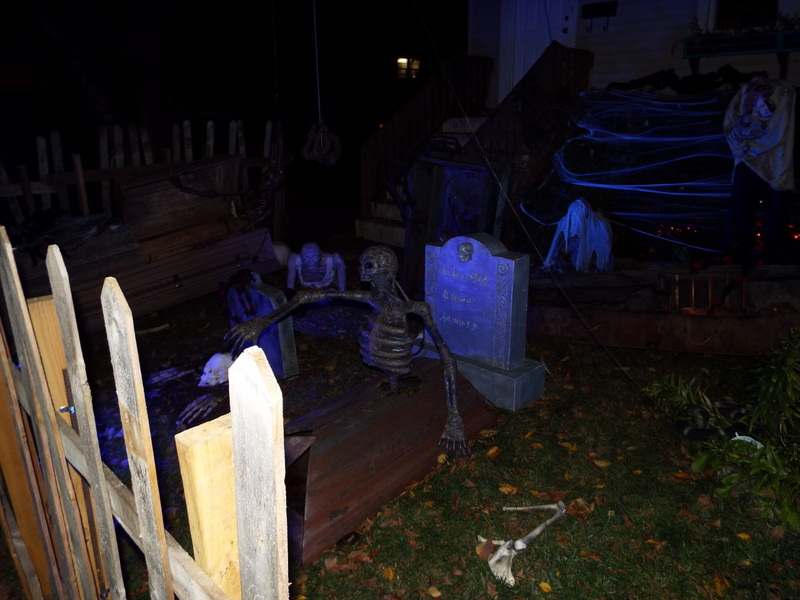 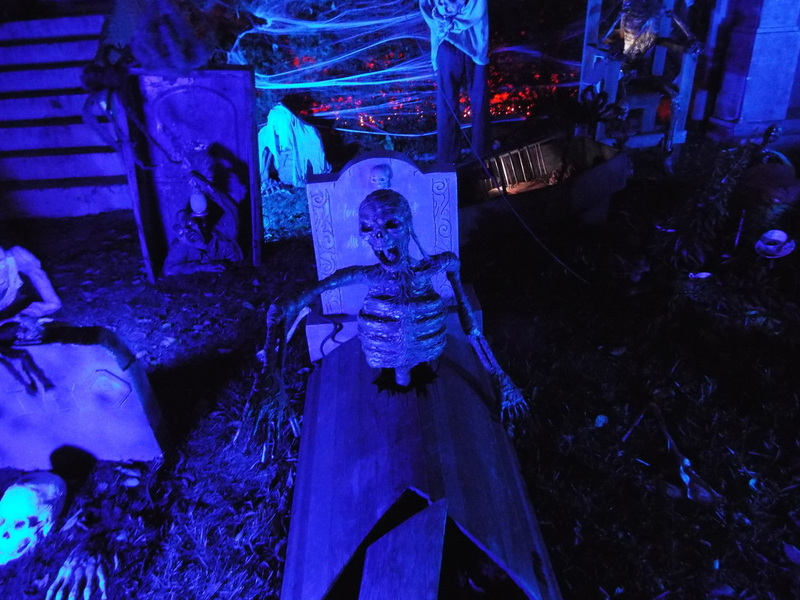 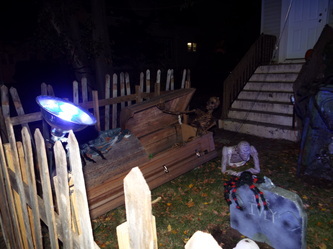 While there is not a lot of space in the front yard of the house, the setup makes great use of the space there is, packing in many static and animated props as well as half a dozen coffins of various types, a crypt, and even a skeleton in an electric chair. 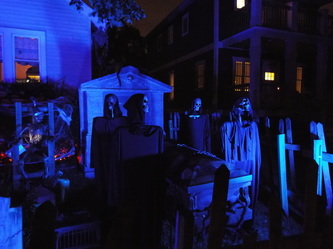 We really have to say that the new addition of the skeletal pallbearers is especially creepy, with their grinning faces looking forward and their hooded garments blowing in the wind, all complemented by some eerie blue lighting that gives the display an otherworldly glow. 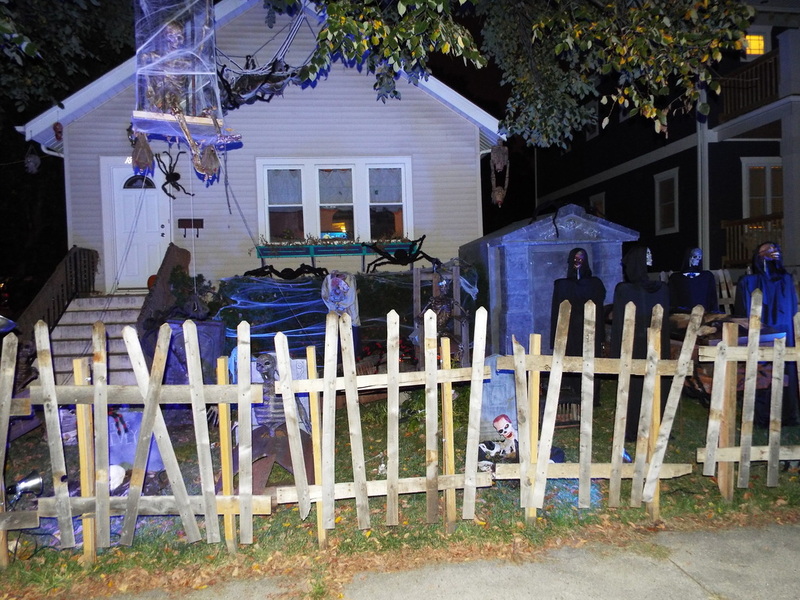 A rickety wooden fence surrounds the main setup, making it look old and abandoned - a place you wouldn't want to visit. 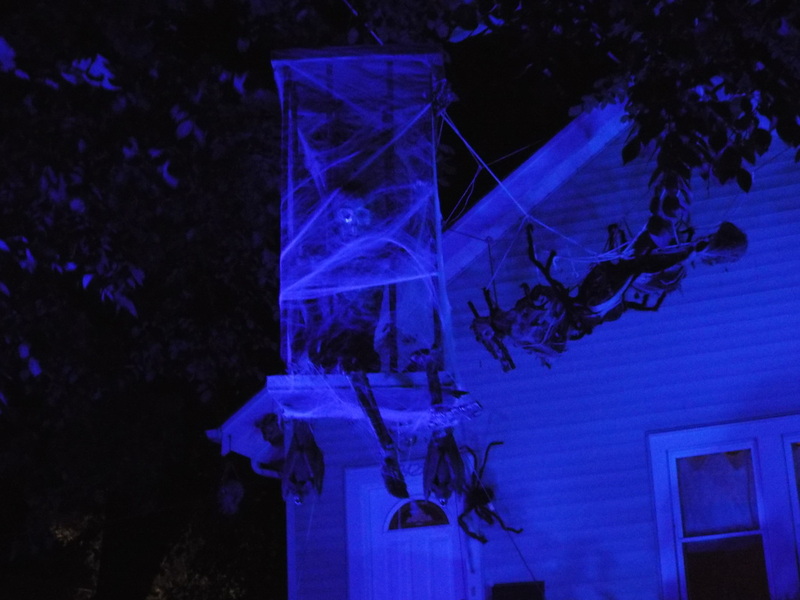 Also present are some large spiders and lots of ensnared victims, including a couple in a nearby tree, several in a hanging cage, and even a giant web hanging from the rooftop. 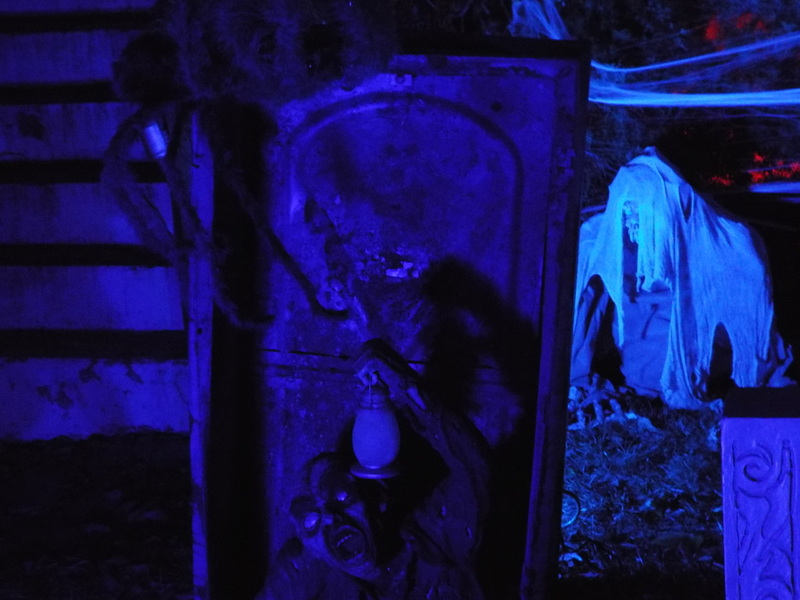 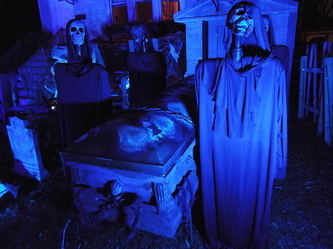 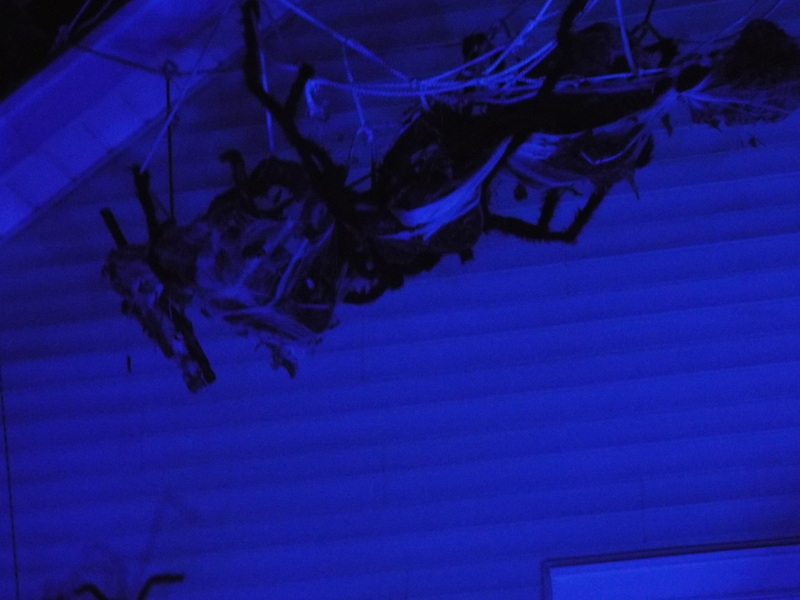 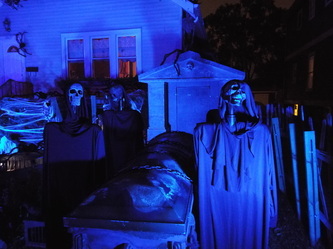 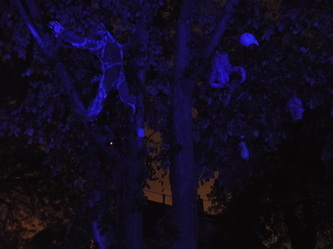 All of the props make for a very effective display, and one that can seriously send some shivers up your spine if you are viewing it at night and the street is quiet. It's an unusual display, and one that's well worth a look!